Our new exhibition Archaeopteryx: Icon of Evolution is opening this Friday, and we know you have questions! In today’s post, Paul Bernhard answers some of the most frequent and important questions about our new fossil. What is the highlight of the exhibition and why? The nearly perfect fossil of Archaeopteryx, with the imprint of a body completely covered with feathers, providing a strong link between dinosaurs and modern birds. To date, ten skeletons have been found, among which, the Thermopolis specimen coming to Houston is considered in many regards as the world’s finest, rivaled only by the Berlin specimen. What else can you see in the exhibition? 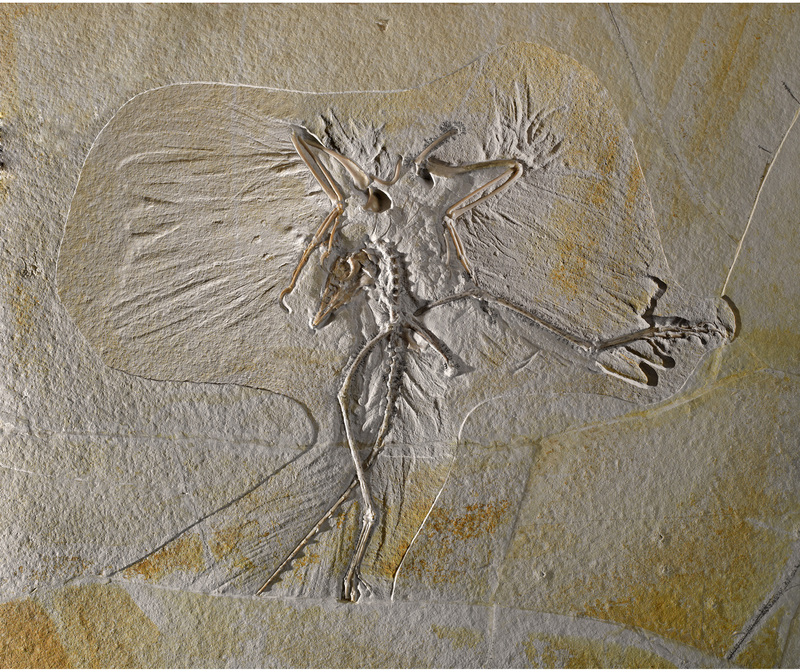 More than a hundred other 150-million-year-old fossils from the world-famous Solnhofen quarries of Bavaria, including fish, turtles, insects, lizards and pterodactyls. Why is Archaeopteryx important to science? Archaeopteryx, classified as the world’s earliest bird and regarded by many experts as the “world’s most important fossil” (take THAT, Lucy! ), provides compelling evidence that modern birds are direct descendants of the dinosaurs. 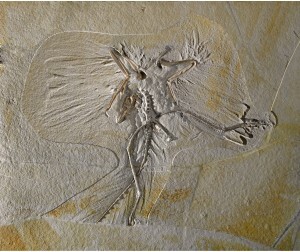 Is there any debate on how this fossil relates to birds? Although the evidence linking Archaeopteryx to birds is pretty persuasive, a spirited controversy amongst scientists will likely rage for some time to come. Detailed anatomical analysis, made possible by the stunning, near-perfect condition of fossils such as the Thermopolis specimen, make the conclusion all but irrefutable. Where was the fossil found? The Thermopolis specimen was found in the world-renowned stone quarries of Solnhofen, Germany. The celebrated quarries are known around the world for high quality “lithographic limestone,” the original–and still optimum–source of rock plates for the world’s first lithographic printing. Before the smooth, warm-hued limestone quarried at Solnhofen was used in lithography, it was prized for its beauty and durability as a carving and building stone. But perhaps most significantly, the Solnhofen limestone is among the world’s most prolific sources of superb fossils of animals and plants that lived 150 million years ago. What makes this exhibition important? What is the condition of the fossil – can you see the feathers clearly? Is there a certain pattern to the feathers? There are only ten fossil Archaeopteryxin the entire world, and the Thermopolis specimen on display in Houston is in many ways the most complete of all of them. You can clearly see the imprint of feathers on the bird’s extremities. How big is the fossil? In size, the Thermopolis specimen of Archeopteryx is about the size of a crow. We know you have more questions. Please email them to us at blogadmin@hmns.org. Come learn the answers for yourself by visiting our new exhibition Archaeopteryx: Icon of Evolution, opening this Friday. Paul Bernhard has been actively involved with the Museum’s Wiess Energy Hall for fifteen years, but he still doesn’t know how to assess the influence of the Boycott effect on drilling mud flow, or even how to calculate the Gibbs free energy of PEMFP fuel cells. Nonetheless, due to sheer longevity, Bernhard has become the spokesman for all things energy-related at the Museum. His blog will reflect this. Anytime Issy! We are glad to help!